Escape from Monkey Island is the fourth game in the Monkey Island series, which takes place after Guybrush and Elaine's honeymoon. This installment of the series uses the GrimE engine originally designed for Grim Fandango. Like Grim Fandango, the game uses a 3D engine with 3D rendered characters and pre-rendered backgrounds. The game was released on November 8, 2000 for Windows. 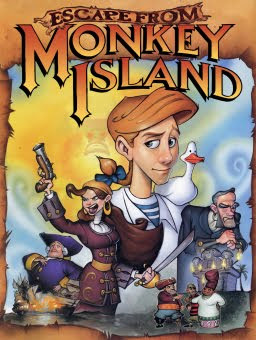 It was released on June 18, 2001 for PlayStation 2 platforms, making it the first game in the series to get a console release since the first Monkey Island game, The Secret of Monkey Island. Escape from Monkey Island was released for the Macintosh in April 2001, making The Curse of Monkey Island the only game in the Monkey Island series that didn't get a Macintosh release. The Curse of Monkey Island, however, is playable on a Macintosh system using the fan made SCUMM interpreter ScummVM. All versions are now out of print, although since Escape from Monkey Island was sold at retail, all versions can still be purchased on the used games market.